The Football Association has cleared referee Mark Clattenburg of using "inappropriate language" towards Chelsea midfielder John Mikel Obi. But Mikel, 25, has been charged by the FA with misconduct following his involvement in the incident. 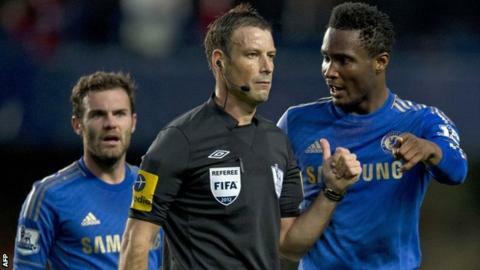 The Blues had claimed Clattenburg directed racial language at Mikel in their home defeat by Manchester United. "The FA's verdict of no case to answer against referee Mark Clattenburg was hardly a surprise. "Ever since it emerged the alleged victim John Obi Mikel hadn't even heard the comment but was relying on second-hand evidence from Brazilian team-mate Ramires, Chelsea's case looked as wafer thin as their managerial contracts. "Rightly, given how high the stakes were, the FA has taken its time to be sure. "And while their reluctance to criticise Chelsea for bringing the case is designed to avoid other players from clamming up if they believe they have been racially abused, this is yet another damaging blow for a club which seems a magnet for trouble." Clattenburg said it was "truly frightening" to have faced the prospect that his career might be over. Following the match at Stamford Bridge on 28 October, the FA interviewed Clattenburg, Mikel and several other Blues players before reaching its decision to clear the official and charge the Nigerian. "It is alleged that in or around the match officials' changing room at the end of the fixture, Mikel used threatening and/or abusive and/or insulting words and/or behaviour," an FA statement read. Mikel has until Friday, 30 November to respond. Chelsea have indicated he will not deny the charge but will request a hearing to "explain the mitigating circumstances". The evidence for Chelsea's allegation towards Clattenburg came from their midfielder Ramires who, when interviewed, explained that his instinctive reaction was to seek confirmation from Mikel as to what the referee said. Mikel, who was being spoken to by Clattenburg, was much closer than Ramires and did not hear what it is suggested was said to him. The two assistant referees and the fourth official revealed they did not hear any of the comments Clattenburg was accused of making, despite being linked up to the referee via microphones. An FA statement also said the complaint by Mikel's team-mate Ramires was "made in good faith". Clattenburg, 37, has always maintained his innocence and the Metropolitan Police dropped its own inquiry earlier this month. He missed four weekends of Premier League matches while the FA investigated Chelsea's complaint. "I am looking forward to putting this behind me and concentrating on refereeing in the Premier League and other competitions," said Clattenburg. "The messages of encouragement from those inside and outside of the game have helped me through the most stressful time of my professional life. "To know you were innocent but there was the opportunity for it to wreck your career was truly frightening. "Racism has no place in football and this experience should not discourage those to speak out if they genuinely believe they are a victim of abuse. "However, there are processes that should be adhered to in order that any investigation can be carried out in a manner that is fair for all parties involved. "I know first hand the ramifications of allegations of this nature being placed into the public domain ahead of a formal process and investigation. I hope no referee has to go through this in the future." Responding to the announcement, a Chelsea statement said: "Chelsea Football Club accepts the Football Association's decision regarding Mark Clattenburg and welcomes the fact that the FA recognises the club and players were correct in reporting the matter. "The club accepts the case is now concluded and notes the FA states the allegation was made in good faith. "Chelsea FC has a duty of care, as do all employers, to act responsibly when such allegations are reported by employees. "We did not take the decision to lodge a formal complaint with the FA lightly and followed the correct processes and protocols throughout." Referees' union Prospect, on behalf of Clattenburg, are asking Chelsea for a full apology and compensation. Police dropped an investigation into the alleged comments towards Chelsea's Mikel and Juan Mata in the Premier League match at Stamford Bridge last month. Chelsea initially suggested Spanish midfielder Mata had also been verbally abused by Clattenburg, before deciding there was insufficient evidence to support these claims.